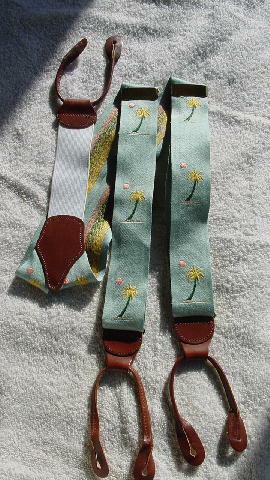 These vintage suspenders/braces are by Dooney & Bourke. On the back of the brass clasps is etched (stamped) Dooney & Bourke. They have a tan center in the back and tan button ends on each end. 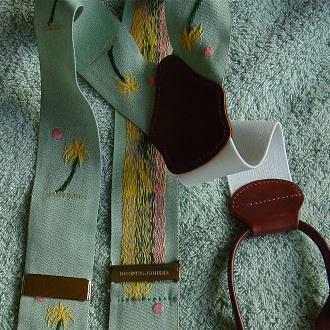 They are in a light seafoam green fabric with a repeating thread design of pink suns and yellow and dark green palm trees on beige sand. The back elastic is in white. They belonged to a former male model who wore them to castings and when he went out on dates.